Ahhh springtime in Paris! I love everything about spring; a time when flowers start sprouting up from the ground and trees growing their leaves. I just appreciate the smells and sights of spring! Oh how I love spring. I love to hear birds chirping in the newly leafing trees, see the crocus peeking out of the flower beds and what I mostly love is not having to bundle up before going anywhere! It’s that time of year when I'm looking forward to a change in the weather and getting out of the doldrums of winter. At this time, I go for simple light meals! I love to spend my days out, so this dinner recipe came into rescue! It was ready in less than 30 mn, and the best part is that it was delicious! In a skillet over medium-high heat, sauté the onion and the garlic in the olive oil. Add the artichoke hearts. Cook to a pale gold color over high heat, then add the tomatoes, seasoning to taste. Simmer 15-20 minutes over medium heat. Dans une sauteuse, faites chauffer l'huile et faites-y revenir l'oignon et l'ail. Ajoutez les artichauts et laissez cuire à feu doux jusqu'à légère coloration. Ajoutez les tomates, assaisonnez selon votre goût et laissez mijoter 15 à 20 mn. Faites cuire les penne dans de l'eau bouillante salée. Égouttez et ajoutez-les à la sauce d'artichauts. Parsemez de persil et de Parmesan. 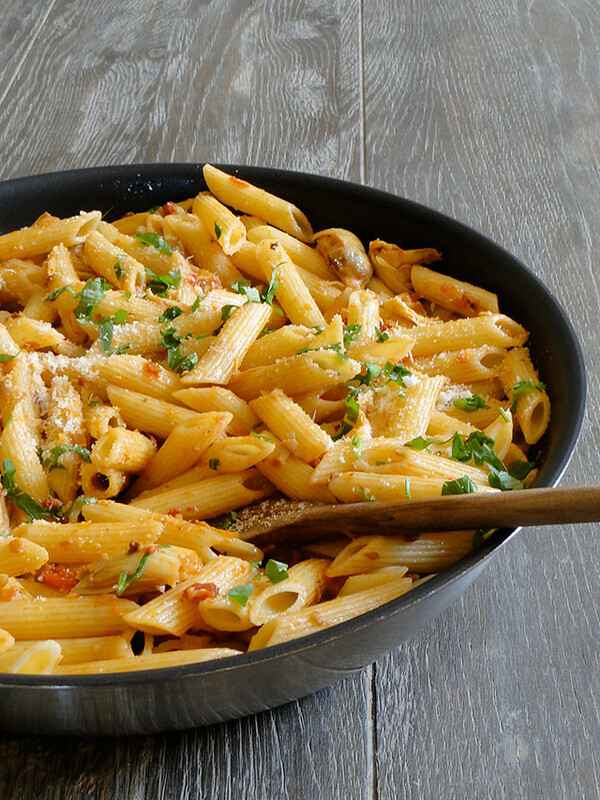 A yummy pasta dish and combination! I have to admit when I saw the title of this post, it didn't inspire me...but after seeing your beautiful photos and the ingredients, I'm inspired with a big WOW. Thanks for sending along this recipe. Bookmarked! Yum, looks great! I love artichokes. Mmmm, I want to eat it right out of the pan! I never made pasta with artichokes, I kind of avoid them :) Thank you for the recipe, looks beautiful and brightly colored, exactly like spring should feel like! I wish I were spending springtime in Paris. Maybe I'll just try your penne w/ artichokes instead. Looks fab! I usually plain old spaghetti with artichoke pesto... its a staple in my kitchen. I'm going to have to try your penne with artichokes instead - it looks and sounds delicious. And your are right - the perfect spring meal! I am always looking for new ways to prepare pasta. thank you for this recipe. Yum, Artichoke lover here! Just came across your wonderful blog and am a new follower!!! So amazing... I want your kitchen table!!!! Including the food served upon it! Hello, I put your amazing blog in my favorite blogs so that my visitors can come to yours and see what a beautiful blog it is ! Had some friends over and made this for dinner tonite. I added sliced chicken apple sausage and served with a light Caesar. Yum, such a hit! Thanks for sharing. I'd love to visit Paris in the spring! For now, I'll settle for spring artichokes. One of my favorite spring vegetables. Sounds great with pasta! This looks delicious! Unfortunately, fresh artichokes are a little too expensive for me right now. Would it be possible to use canned artichoke hearts in this? If yes, when would you add them in? @Liz, you can definitely use canned artichoke hearts, cut them into quarters and follow the recipe as is. love pasta and artichokes, im in! Thank you! This has become one of our favorites!!!! So delicious and quick. I love recipes like this that are unique, yet use ingredients I always have on hand. Have you ever tried freezing the sauce? wow that pasta looks delicious.. but i have a doubt.. I tasted artichoke for the first time last summer when i visited Paris. It tasted bitter. SO when you added it to that pasta how did you neutralise it's bitter taste ? I just finished eating this for dinner and it was so good! I added crushed red pepper because I am a fiend for spicy pasta. This is amazing! 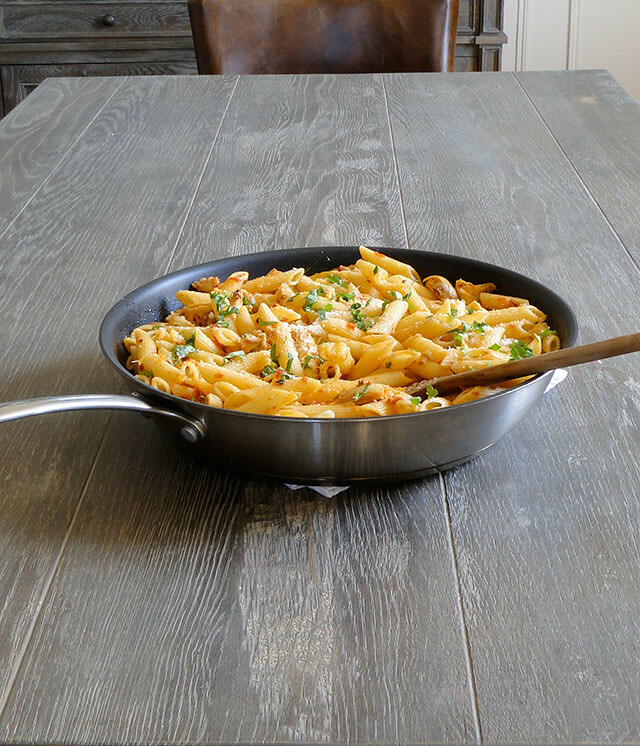 Didn't have parlsey.... added red pepper flakes and used Spinach Penne... yum, yum, yum! I made this and it was SO good. The second time I added a little pesto and grilled chicken. Delicious. Thanks for the great recipe. I was looking for a recipe to make with ingredients I had in my fridge and pantry- canned artichoke hearts, chicken, fresh tomatoes and parsley from my garden, rotini since I did not have penne, garlic, onion. I performed a google search and found your fabulous recipe. I made this dish and added sautéed chicken. This was fantastic my husband loved it!!! Thanks for posting such a delicious recipe. Anonymous in East Norriton, PA, USA. 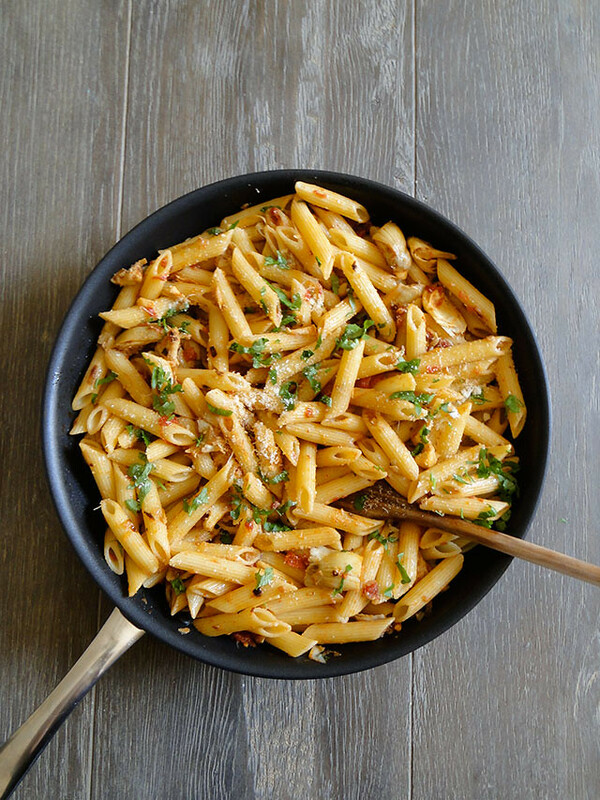 I make a pasta similar to this with spinach as the main ingredient, along with a can of tomatoes and a can of artichokes.. served over penne with feta sprinkled over. YUM.. one of our favs.. the artichokes totally make it! Yummy! I added cut up grilled chicken and used a can of Italian seasoned tomatoes. I didn't have Parmesan cheese so I sprinkled some shredded mozzarella instead and it came out great.